Elevated view of the pile-pontoon railroad bridge across the Mississippi River at Prairie du Chien. The bridge was built and patented by John Lawler in 1874 and it solved the problem of providing railroad crossing of the Mississippi without stopping the river traffic. 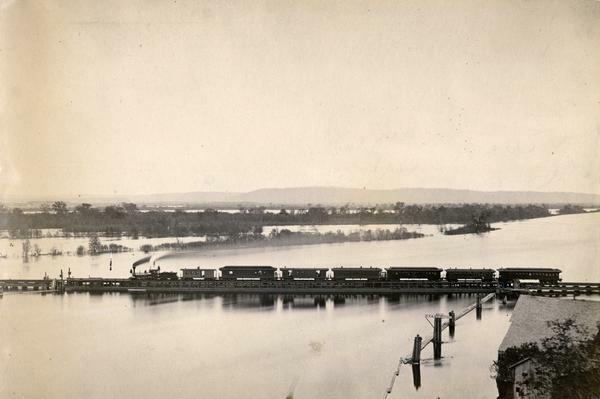 Prior to the Lawler bridge, the railroad cars were towed across the river on barges. The Lawler Bridge was 8000 feet long, crossing both channels of the river and an intervening island. It was constructed in two parts, the pile, or stationary part, and the pontoon or movable part, which consisted of two floating draws, one in each channel, which, when closed, form an unbroken track, permitting a safe and rapid railroad crossing. When open, the bridge allowed river traffic to pass with ease. The pile portion of the bridge was of ordinary railroad construction, but the draw over each channel consisted of one pontoon with a 12 inch draft. The Lawler bridge was replaced in 1910.